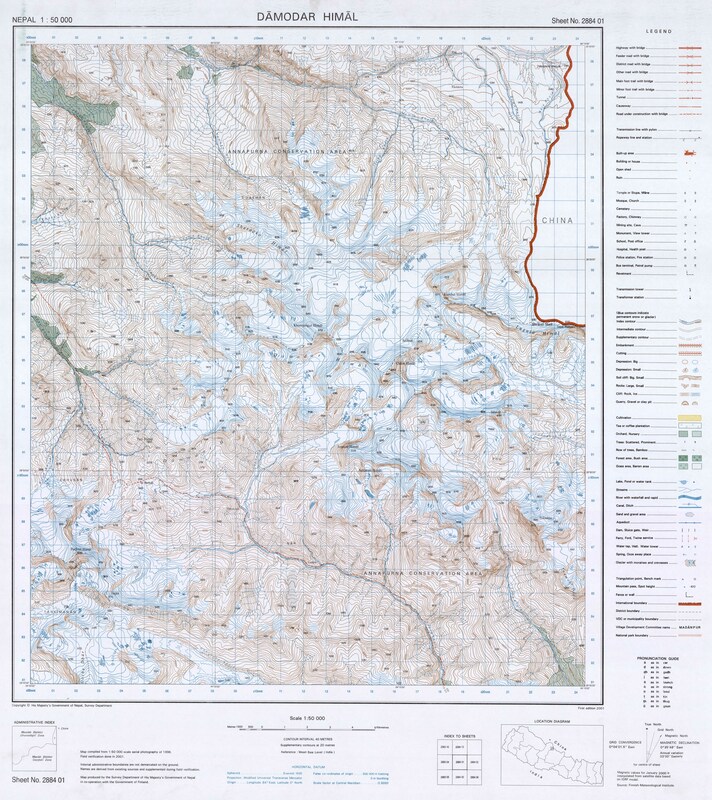 Nepal Govt 1:50000 topo maps: 2884 01 Damodar Himal. 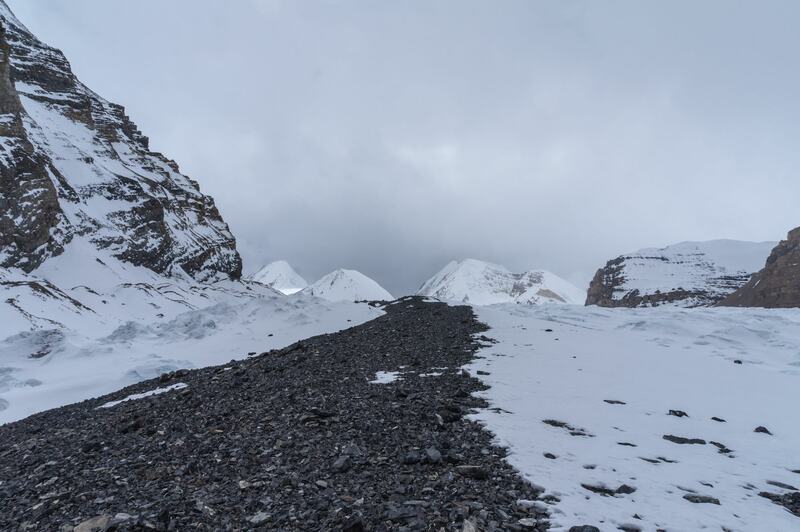 We started the day off at 5250 meters; by early afternoon we would be at about 5700 meters, having mostly walked up the lateral moraine running along the west side of the Khumjungar glacier before walking across the glacier to a long thin thread of moraine on the other side. 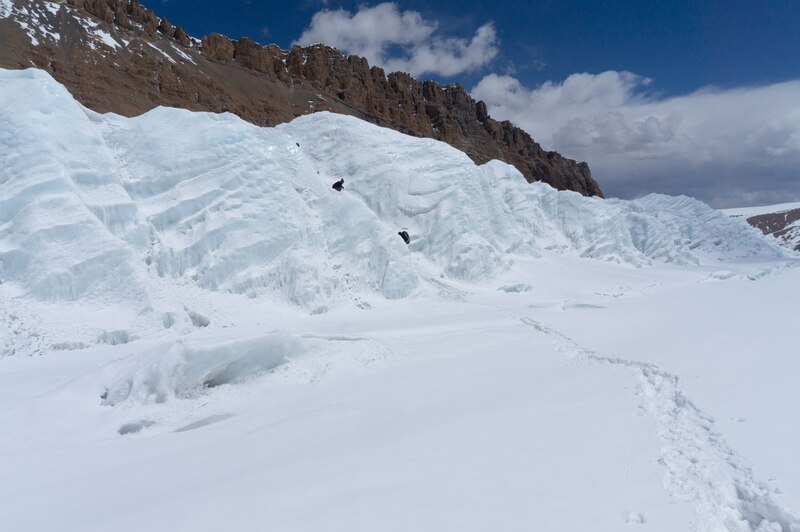 We did not experience the impassable crevasses and seracs mentioned by the climber we had met at Ghuma Thanti. 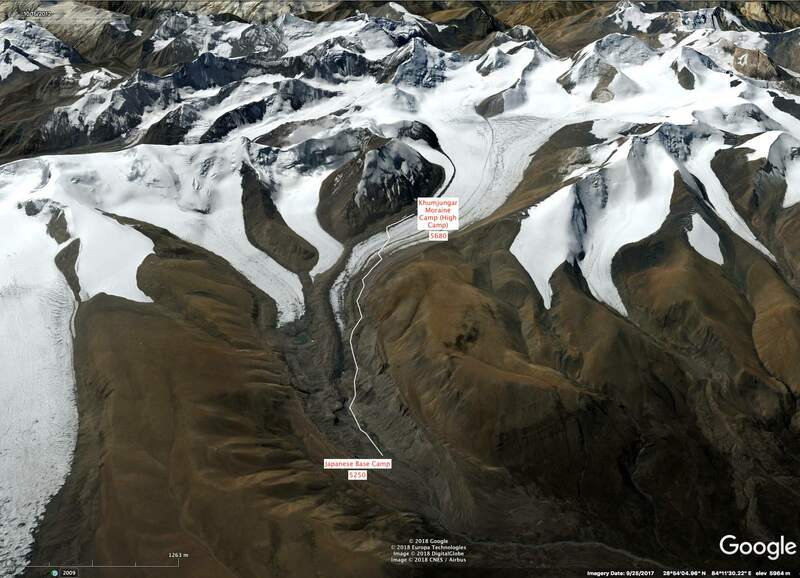 They were supposedly the reason they gave up on the planned ascent of Saribung La and Peak and turned back from Japanese Base Camp. 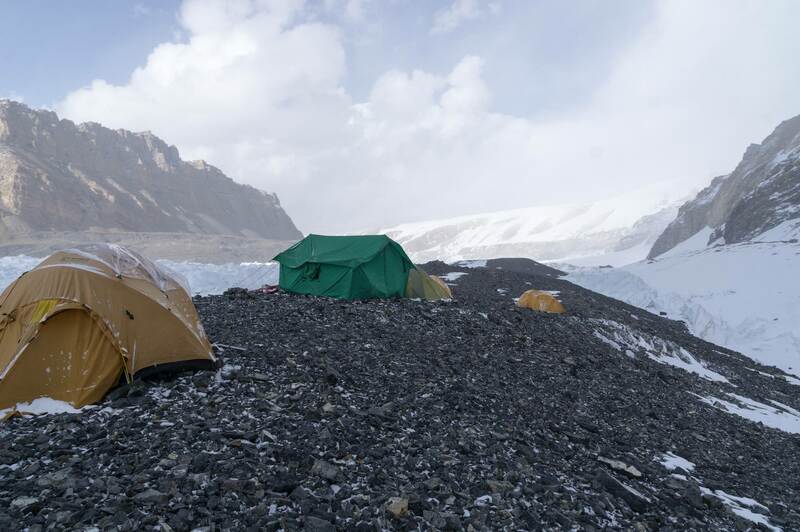 She had spent the day at the Base Camp while the guide did reconnaissance up the glacier. Much of the day’s ascent was on snow. 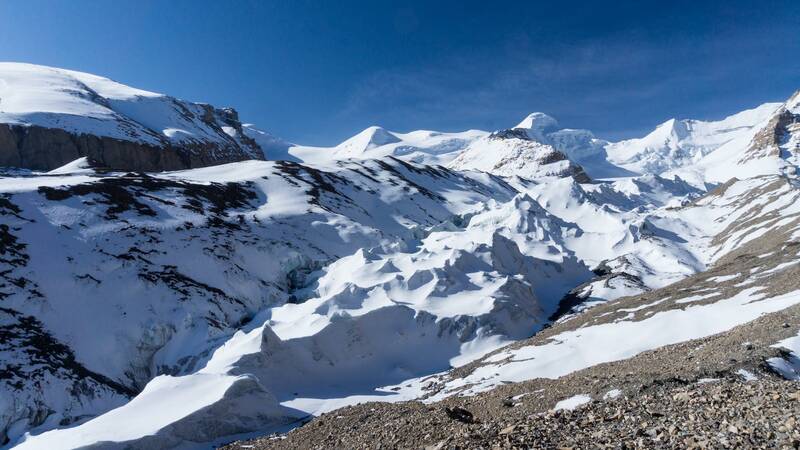 It proved to be less demanding than the 560 meters of altitude gain we had made a few days before from our Batsyak Camp on the Parsye Khola (4890) to Batsyak La (5450). 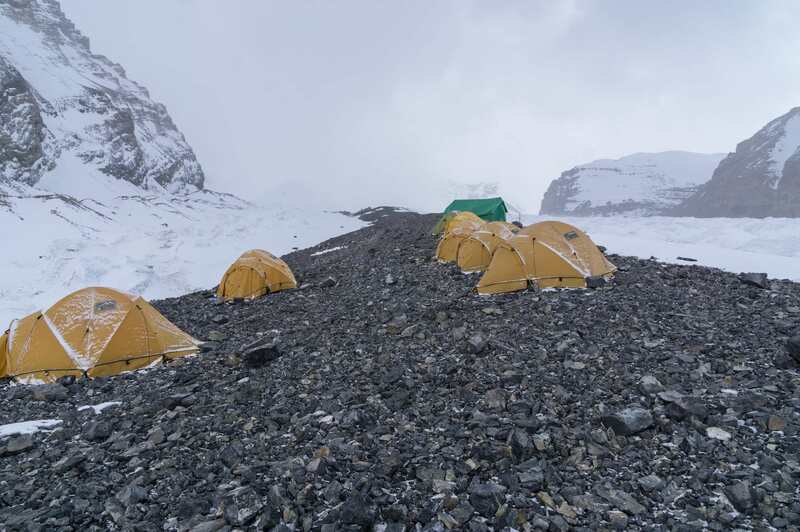 It was sunny and windless during the morning while we did most of our walking and only clouded over and started to snow in mid-afternoon after the camp had been set up. As I walked up the “trail” layer after layer of clothing came off! For the first time ever on a mountain trek, I stopped and took off my fleece long johns! While they had been appreciated at 6 a.m. when the temperature was -7ºC in the tent, by 9:30 they were making my legs feel dead. 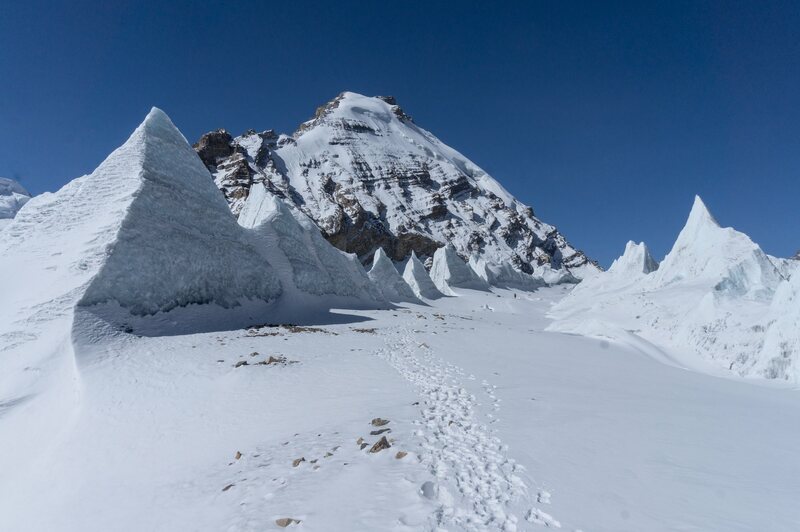 Everyone – trekkers and porters – walked at a different pace, taking time to frame photos or to put down the 30 kg. + pack load for a brief rest. 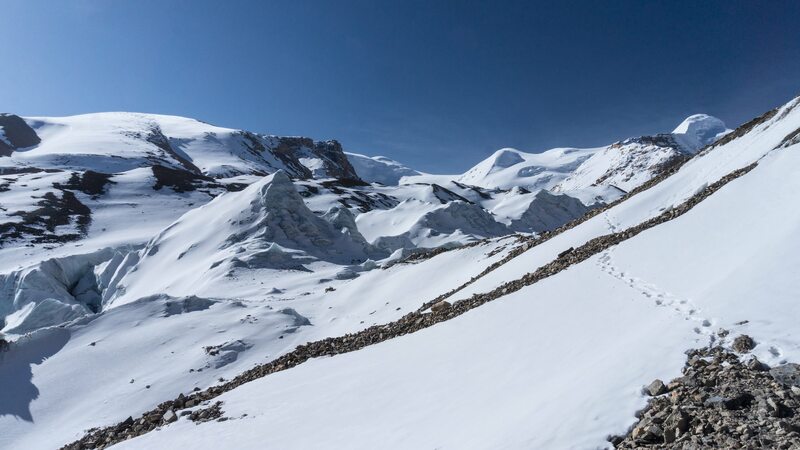 I ended up somewhere in the middle of the string of bodies moving up the glacier and followed the footsteps of those ahead of me, occasionally passing porters and then being passed by them thirty minutes later. 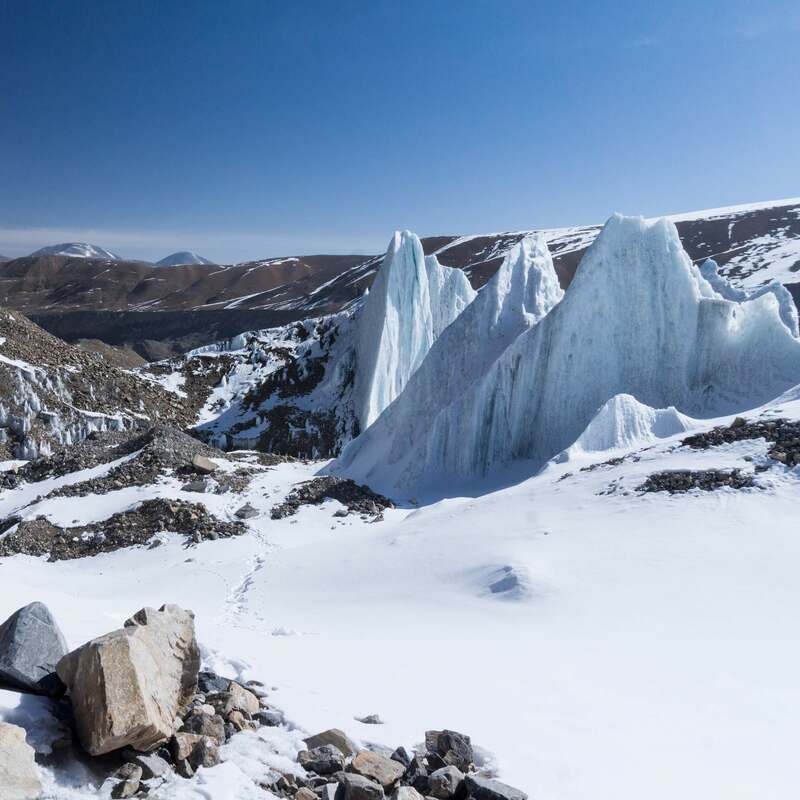 Looking ahead – as in the photo above – or looking back at where we’d come from – as in the photo below…always footsteps to follow if you are not Tsering Sherpa breaking trail the front of the line! 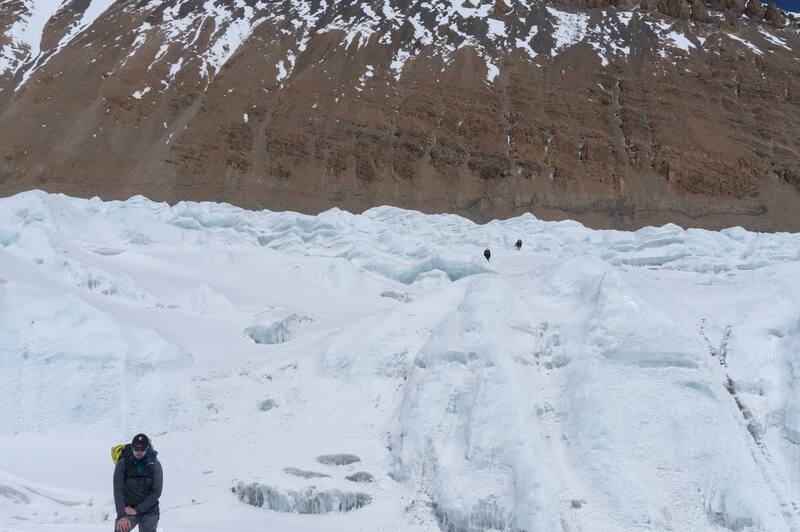 Then came the traverse across the glacier to the campsite on the other side. In the photo below some of the crew are already making their way beyond the ice ramp that they have climbed up with the aid of a fixed rope. It was our first (of two) instances this morning where it got more complicated than just walking with trekking poles. Porters on the left-hand side of the image heading across the glacier to the rock face – enlarge the pic for a better view! In the image below is a close-up of the ice ramp and shows our cook/ice screw and rope technician watching someone pull himself up the ten meters or so of ice. It took all of twenty seconds per person to get to the top and then it was fairly straightforward walk the rest of the way. No need for mountaineering boots here! It wasn’t even noon and there we were on a long narrow thread of scree on the east side of the glacier. 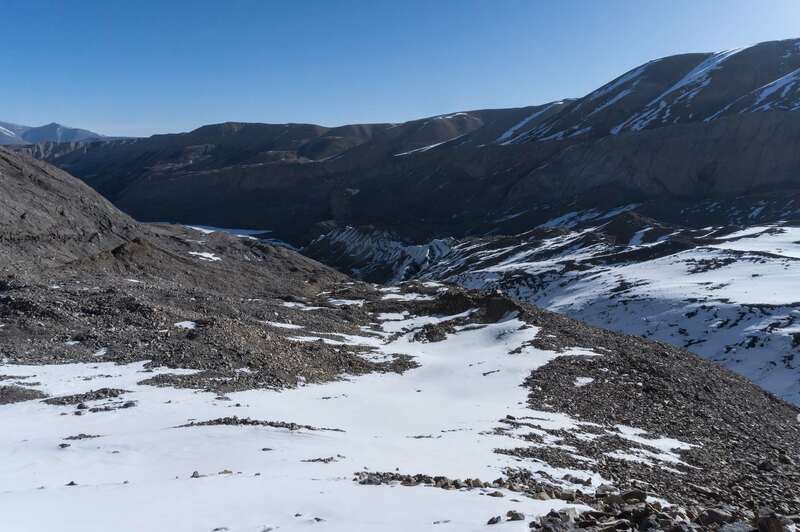 The moraine runs for about a half-kilometer; the image below looks down the moraine to where we have come from while the next two look up the moraine in the direction of the next morning’s walk. This would be the one night of the trek when the dining tent would not be set up! Instead, we would be served in our tents! Tea, Dal Bhatt, it all arrived at our door thanks to our two sherpas, Tsering and Kamansing. 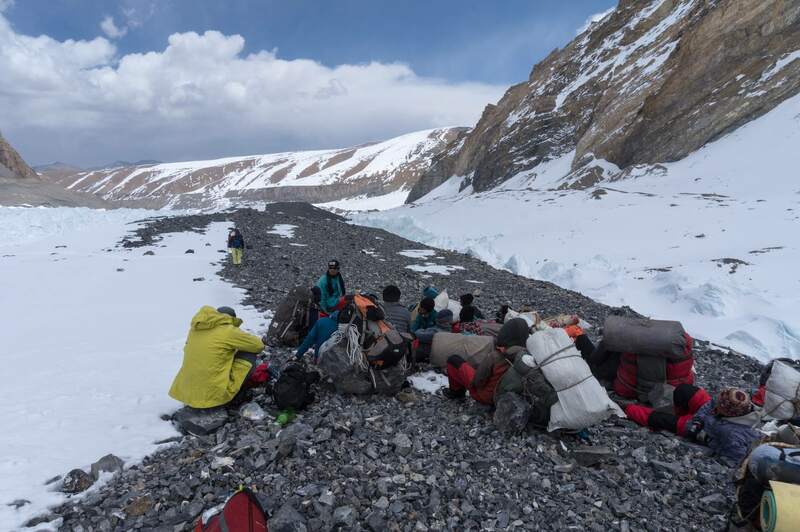 As it is, the dining tent table and chairs had been flown out in the morning by the helicopter along with the porter suffering from high altitude cerebral edema and the other porter with the leg problem. We were all relieved to find out the next day via sat phone that they were doing fine down in Kathmandu. My sleeping pads were arranged in an off-center way to take into account some badly placed rocks that were pushing their way up into the tent floor! Somehow the closed-cell foam underpad and my cushy Neo-Air Thermarest made it work, and I would get a decent night’s sleep, having swallowed the last of my Diamox tablets. I was not the only one who would fall asleep thinking about tomorrow’s ascent and crossing of Saribung La, the literal high point of our trip. Twelve days of our trek were already done – now we just had to deal with lucky 13! 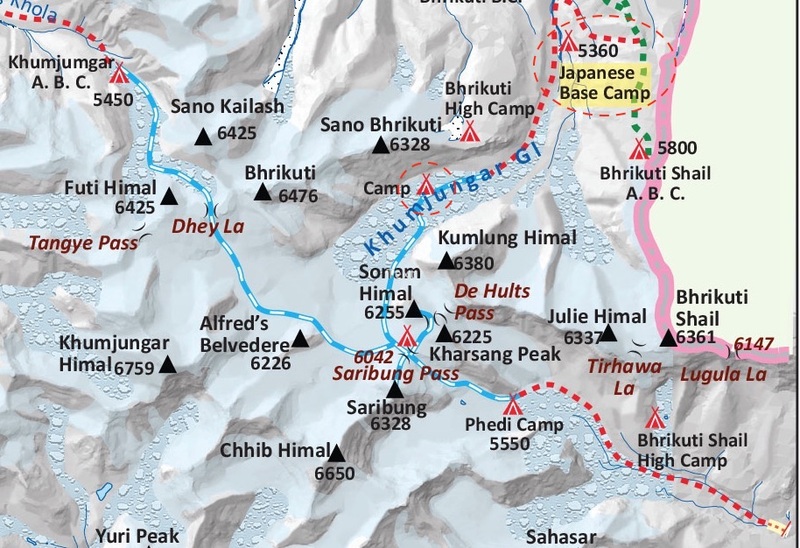 The red circle on the 2884 01 Damodar Himal topo map above is my best estimate of our Khumjungar Glacier High Camp. I found evidence of garbage left by previous trekking and climbing parties as I walked up and down the moraine. The altitude given in various trip reports for this campsite will depend on where on the moraine they decided to make camp. There is maybe a thirty-meter variation from one end to the other. 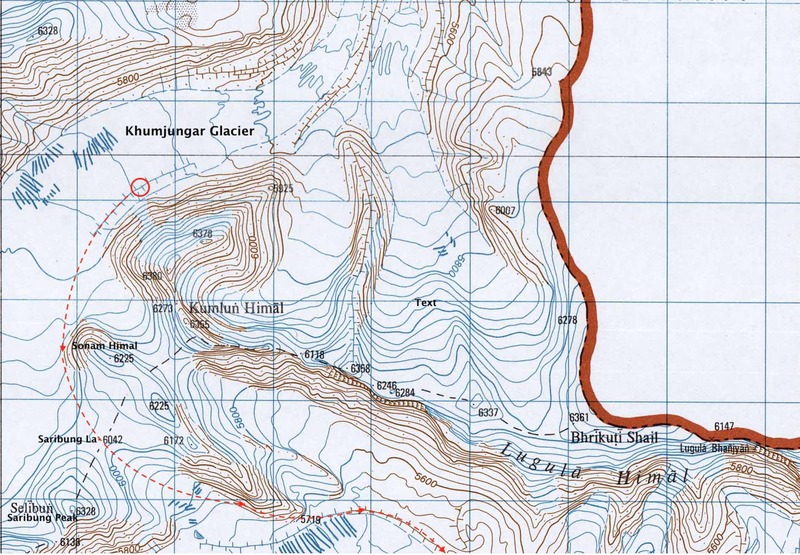 Also on the map is the next morning’s route to the literal high point of the trek as we walk up to Saribung La at 6042! Amazingly, the next day would end with us at 5000 meters!